Will not mark or scratch expensive or delicate firearm parts, but holds them firmly without damage. Durable, nylon-reinforced rubber is permanently bonded to lightweight aluminum, replaceable jaws. 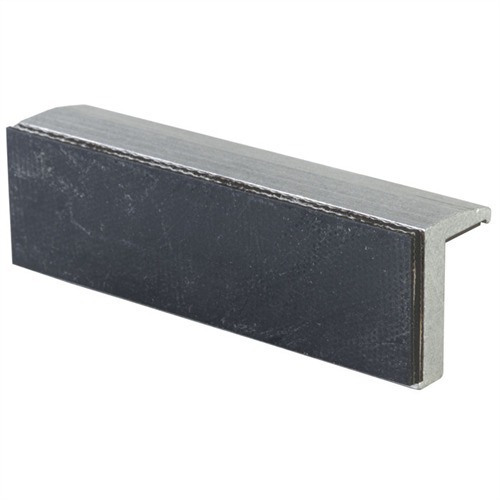 Wide retaining lip with nitrile magnet on the underside keeps jaws in place; drops right onto any 4", 5" or 6" steel bench vise and stays put. SPECS: Aluminum jaws, rubber face. 4" (10cm) long, 3/8" (9.5mm) thick, 1¼" (3.8cm) wide face. Vil ikke merke eller bunnen dyre eller delikat skytevåpen deler, men holder dem fast uten skade. Slitesterk, nylon-forsterket gummi er permanent festet til lette aluminium, utskiftbare jaws. Bredt beholde leppe med nitril magnet på undersiden holder jaws på plass. DROPS rett på alle 4" 5" eller 6" stål benk skruestikke og forblir satt. Spesifikasjoner: aluminium jaws, gummi ansiktet. 4"(10cm) lang, 3/8" (9,5 mm) tykk, 1¼"(3,8 cm) bred ansikt. I would use this product to clamp parts I don't want to scratch or mar, except when taking the part off of the "Rubber Faced Vise Jaws" they stick to the parts. The real problem with this product is the glue they used to mount the rubber face and the magnetic strip does not hold. The rubber starts to peel off and the magnet sticks the vise when you remove the jaws. I have had these jaw faces for a long time - maybe 15 years or so, and they do a very good job of protecting while holding tight. The magnets however, are weak and the faces fall off when the vise is opened. Other than that, I would have given it 5 stars. I use these jaws every day in a 4" Wilton vise on my primary workbench. No, the magnets won't hold the jaws to a refrigerator door, but they are strong enough to keep the magnets in place while I open and close the vise. The rubber pads are a bit sticky when I clamp a flat surface like a shotgun receiver, but they also hold that receiver without scratching it, which is the intended purpose. I like them. I use it on my 4" utility vise. It really protects the object being held and still holds very tight. The reason for not giving it 5 stars is the weak magnets. I bought mine about 15 years back and the weak magnets haven't gotten any stronger with time. Bought a pair of these about 3 years ago when I started my gun repair operation. Best set I have ever owned for the price. I have tourtered these things for three years and I need to replace them. Magnets seemed to wear out really quick but I think that was due to the fact that my vice had a rare earth magnet on it for some time. I would recommend to any professional or DIY. Lightweight aluminum angles are a little thin, but sturdy enough. The rubber pads give a good grip and provide some cushion. But as the other reviews noted, the refrigerator magnet strips they use are very weak and just barely hold on to your vice jaws. I have been using mine every day for 5 years and have abused them along the way and they still do a great job. I have had to reglue them a time or two and the magnets are still the same as they were the day I recieved them, barely able to hold. But I really dont mind because they work! I put a pair of the Super Hold Vise Jaw Pads (852-002-200) on my new vise but still have the other vise and pads on the bench. Both were a good purchase!! Produsentnr. : 48100 050806101517 Vil ikke merke eller bunnen dyre eller delikat skytevåpen deler, men holder dem fast uten skade. Slitesterk, nylon-forsterket gummi er permanent festet til lette aluminium, utskiftbare jaws. Bredt beholde leppe med nitril magnet på undersiden holder jaws på plass. DROPS rett på alle 4" 5" eller 6" stål benk skruestikke og forblir satt.